Greater trochanteric pain syndrome is a common, but often misdiagnosed cause of lateral hip pain. Recent advances in the imaging of the hip has improved the understanding of the causative mechanisms of greater trochanteric pain syndrome (GTPS). The syndrome encompasses a wide spectrum of causes including tendinosis, muscle tears, iliotibial band (ITB) disorders and surrounding soft tissue pathology. Clinically GTPS presents with lateral hip tenderness and pain with resisted abduction. A positive Trendelenburg test is the most sensitive predictor of a gluteal tear. Altered lower limb biomechanics is proposed as an important predisposing factor for gluteal muscle pathology. Many conditions are associated with GTPS: some of them may predispose to GTPS, while others may mimic the symptoms. 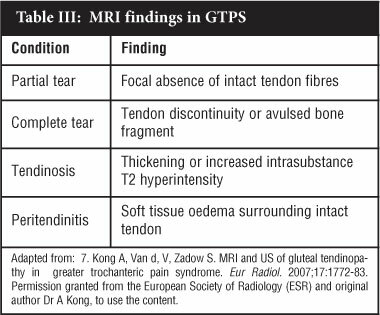 Although plain radiographs are still important for ruling out other causes of hip pain, MRI has become the imaging modality of choice in GTPS. Most cases of GTPS can be regarded as self-limiting. Conservative modalities (rest, NSAIDs, physiotherapy) are still the mainstay of treatment. Corticosteroid injections are still widely used and reported to be successful. Proven gluteal muscle tears are treated with surgical repair and bursectomy. Endoscopic techniques have become increasingly popular. Greater trochanteric pain syndrome (GTPS) is a clinical condition that primary care physicians, sports physicians, rheumatologists and orthopaedic surgeons are commonly faced with.1 Yet, it is an often underdiagnosed and misunderstood condition.2 In an attempt to further the understanding of the GTPS, we reviewed the literature by searching via Pubmed/Medline using the terms 'greater trochanteric pain syndrome, 'trochanteric bursitis' and 'lateral hip pain. Classically the cause of lateral hip pain was described as a bursitis. Several orthopaedic text books described trochanteric or subgluteal bursitis.9 'Trochanteric bursitis' was first described in 1923 by Stegemann for symptoms of lateral hip pain.10 In 1958 Leonard suggested the term trochanteric syndrome for pain in the lateral hip region. GTPS has been described as a 'great mimicker' and can mimic pain from other causes like osteoarthritis (hip), spinal pathology (L4/5 level) and pain of myofascial origin. 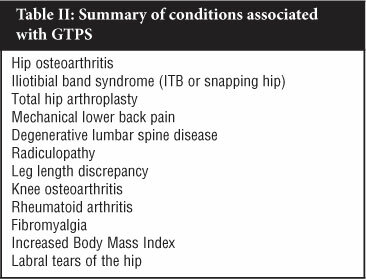 Several associated conditions can also simulate the symptoms of GTPS.2,3,13 A comprehensive understanding of the complexities of lateral hip pain is vital in making an accurate diagnosis. Walker et al13 found a higher incidence of GTPS in patients with degenerative spine disease. They postulated that compromised function of the superior gluteal nerve, which supplies the gluteus medius and minimus muscles, would lead to weakened abductor function and ultimately altered lower limb biomechanics. This, in turn, would predispose to gluteal muscle pathology. Domb et al26 reported that most partial gluteus medius tears are tears of the under surface of the tendon similar to PASTA (partial articular supraspinatus tendon avulsion) lesions at the shoulder. In contrast with the shoulder, at the hip this lesion is extremely difficult to visualise with endoscopy. It is important to palpate the area 2 cm proximal to the medial joint line of the knee, the proximal trapezius and the extensor mass distal to the lateral epicondyle of the elbow as well, as this could indicate generalised myofascial tenderness.22 When assessing the range of motion of the hip, external rotation and abduction can produce symptoms. Internal rotation occasionally and extension rarely give pain. The typical pain can be reproduced with resisted active abduction. Painful flexion and extension may indicate intra-articular hip pathology. The Patrick-FABERE test should be positive in GTPS and OA.2-4,27 In a study correlating clinical presentation with MRI diagnosis, Bird et al1 found that the Trendelenburg test was the most reliable test to predict gluteal tears (sensitivity 72.2% and specificity 76.9%). Ultrasound can be helpful in demonstrating facetal trochanteric anatomy. A so-called 'bald' facet is suggestive of a complete tear of the tendon. Tendinosis may manifest as tendon thickening and heterogeneous, decreased echogenicity. Muscle wasting with fatty infiltration and bursal fluid accumulation can also be appreciated on ultrasound. Magnetic resonance imaging (MRI) is now regarded as the gold standard investigation for recalcitrant lateral hip pain. New insight has been gained by the use of MRI in musculoskeletal imaging. It has several advantages over X-rays, ultrasound and scintigraphy, one of which is that deep and superficial soft tissue structures can be evaluated.1,28 MRI has the ability to evaluate direct signs (peritendinitis, tendinosis and partial or complete tears) and indirect signs (bursal fluid, muscular fatty atrophy, bony changes or calcification of tendon the insertion) of abductor tendon pathology and can also evaluate other structures associated with lateral hip pain,7 though Voos et al reported difficulty in distinguishing high-grade partial tears from full thickness tears on MRI.23 A summary of the most pertinent findings on MRI is given in Table III. Most cases of GTPS can be regarded as self-limiting.3 The initial or acute treatment of GTPS involves conservative modalities like non-steroidal anti-inflammatory drugs (NSAIDS), ice and rest. As the pain decreases, the subacute management includes modalities like ultrasound and massage. Rehabilitative and preventative measures like weight loss, behavioural modification and physiotherapy to improve muscle strength, flexibility and joint mechanics are part of many treatment regimens.3,29 The true efficacy of these 'conservative' treatments has not been reported in controlled studies. No studies looking at the placebo effect of the injections have been published. A recent epidemiological study has shown that in a primary setting the long-term recovery rate is 2.7 times higher in patients who had been treated with corticosteroid injections.18 Cohen et al29 found no difference in the efficacy of landmark-guided injections and fluoroscopic-guided injections. Failed response to local injections can be ascribed to several reasons ranging from misdiagnosis, underlying gluteus medius tendinopathy or inaccurate needle placement. Modalities used in other tendinoses (tennis/golf elbow, Achilles tendinopathy) such as autologous blood injection33 and eccentric loading and stretch exercises34,35 have not been reported on in the treatment of gluteus tendinopathy. Greater trochanteric pain syndrome is a common, often underdiagnosed condition that is characterised by lateral hip pain that may radiate to the buttock or lateral thigh. 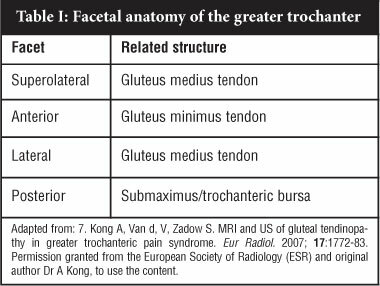 The consensus in the latest literature is that gluteus medius tendon pathology is the underlying cause, but that trochanteric bursitis may play an important role in causing pain. Several conditions are associated with GTPS: some of them may predispose to GTPS, while others may mimic the symptoms. Clinically patients have tenderness over the greater trochanter in the side-lying position and pain with resisted abduction. MRI has become the imaging study of choice and provides accurate detail of the relevant soft tissue structures. The mainstay of treatment still involves conservative measures including lifestyle changes, physiotherapy, NSAIDs and corticosteroid injections. In resistant cases or cases with proven gluteus medius tendon tears, endoscopic bursectomy with tendon repair has been shown to be effective. No benefits of any form have been received from a commercial party related directly or indirectly to the subject of this article. The content of this article is the sole work of the authors.